There were no Facebook posts. No progress-tracking tweets. No self-promoting Instagrams on Pinterest. That’s how it is with quiet types like my husband, Hank. While the rest of us were busy chattering away online, he’s been getting on with the business of writing. 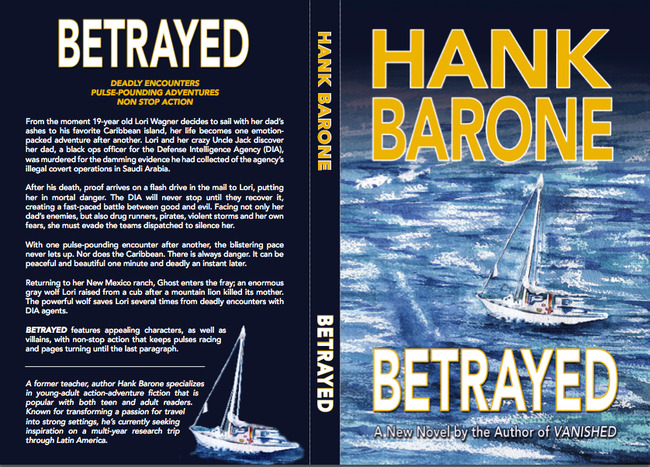 Yesterday (March 27, 2013), Hank published his third action-adventure novel, Betrayed, a fast-paced survival tale with surprises and thrills galore. The same day, he submitted the manuscript of his fourth book, Bloodlines, for editing. An admirable accomplishment. As his wife, I’m obviously a biased admirer of his work. But as a writer currently struggling to write my first book, I’m truly impressed. Action-adventure fiction is not my usual reading, but Betrayed kept me up reading well past my bedtime. Like Hank’s previous books, it hooked me right from the start and didn’t let up until the last page. “From the moment 19-year old Lori Wagner decides to sail with her dad’s ashes to his favorite Caribbean island, her life becomes one emotion-packed adventure after another. Lori and her crazy Uncle Jack discover her dad, a black ops officer for the Defense Intelligence Agency (DIA), was murdered for the damming evidence he had collected of the agency’s illegal covert operations in Saudi Arabia. After his death, proof arrives on a flash drive in the mail to Lori, putting her in mortal danger. The DIA will never stop until they recover it, creating a fast-paced battle between good and evil. Facing not only her dad’s enemies, but also drug runners, pirates, violent storms and her own fears, she must evade the teams dispatched to silence her. With one pulse-pounding encounter after another, the blistering pace never lets up. Nor does the Caribbean. There is always danger. It can be peaceful and beautiful one minute and deadly an instant later. Preview the first three chapters - FREE - on your Kindle. Not a Kindle owner? No worries. Download a free Kindle app on your Android phone or tablet, iPad, iPhone, Mac, Windows 8 PC or tablet, BlackBerry, or Windows Phone. With the hard work of writing completed, the challenge becomes getting people to read and talk about it. 1. Use the links below to print, e-mail or share this posting with book lovers. Or direct people directly to Hank’s website, HankBarone.com, if that’s easier. 2. Buy the book and tell us how much you love it. Actually, tell everyone ELSE how much you love it. If you’re squeamish about thrillers, give a copy to someone who loves to read stories packed with action, suspense, plot twists and surprises. 3. Review the book on Amazon. This helps a lot. 4. Post a link on Facebook. Might as well make that Facebook addiction helpful! Tag me so I’ll be notified and can play it forward. 5. Tweet about it. Blog about it. Pin it on your Pinterest boards. Put all those time-wasters we love so much to good use. 6. Go down to your closest bookstore or library and ask them to stock it on their shelves. 7. If you have a Goodreads account, review it there as well. That reminds me! I haven’t done this yet. See you there. 8. Are you a teacher? Awesome. Suggest the book to your students. They’ll learn something, I’m sure. The books are young-adult, action-adventure novels featuring settings where Hank and I have lived and traveled and are written for both teen and adult readers. 9. Leave copies in random places. Bookcrossing.com is a cool way to label and track the books as they make their way around the planet. 10. Be sure to return and tell us what you think. You can post your comments below or send Hank your thoughts directly. I also want to thank those of you who read and helped spread the word about Hank’s previous books - Vanished and Hunted. Your support helps to keep this family business going. It really does. About Ellen Barone: Consumer travel expert Ellen Barone is the founder and publisher of TravelUpdatesbyEllenBarone.com and YourLifeIsATrip.com. She’s currently at work on her first book - I COULD LIVE HERE. Stay connected on Twitter at,Facebook, Google+, Pinterest and LinkedIn or click here to learn more.